Pleuronectes aquosus Mitchill, 1815, New York, United States. 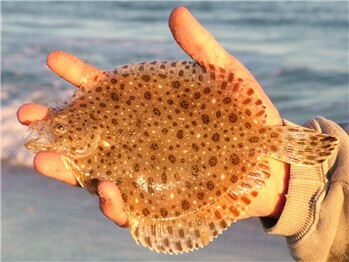 English: Sand dab; spotted flounder, brill; French: Turbot de sable. Medium-sized, sinistral flatfish characterized by a deep, nearly round, thin, and almost translucent body with a rounded caudal fin. The head is small with a relatively large mouth having a wide gape and with a projecting lower jaw that has a knob on its ventral surface. Small teeth are present on both jaws. The first 10–12 fin rays of the dorsal fin are free from the fin membrane along the distal half and branched toward their tips, forming a conspicuous fringe. Eyes are large, separated, and nearly equal in position on the head. Pelvic fin bases are elongated and slightly asymmetrical. Scales are cycloid and smooth to the touch. The lateral line is strongly arched above the pectoral fin. The ocular side is rather translucent greenish olive or slightly reddish brown or pale slate-brown, mottled with darker and paler irregular markings and usually dotted with many small, irregularly shaped brown spots and sometimes also with white spots that vary in size. Blind side is generally whitish, occasionally with some irregular darker blotches. Can reach sizes to about 15.7 in (40 cm) and weights to about 2.2 lb (1 kg), but adults typically average only 9.8–11.8 in (25–30 cm). Can live to be 15–18 years of age, but most individuals are 11 years old or younger. Western North Atlantic in lower estuarine and marine waters on the inner continental shelf of eastern North America from the Gulf of Saint Lawrence to Florida. Most abundant from Georges Bank to Chesapeake Bay. Shallow, inshore waters from the high tide line down to about 656 ft (200 m), with the greatest numbers occurring at depths of less than 180 ft (55 m). 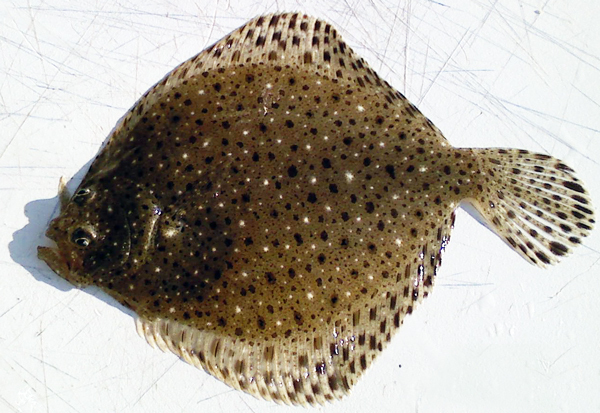 They occur most often on sandy bottoms but also can be found on softer and muddier sediments. Diurnally active. Often lie on or within sandy sediments. 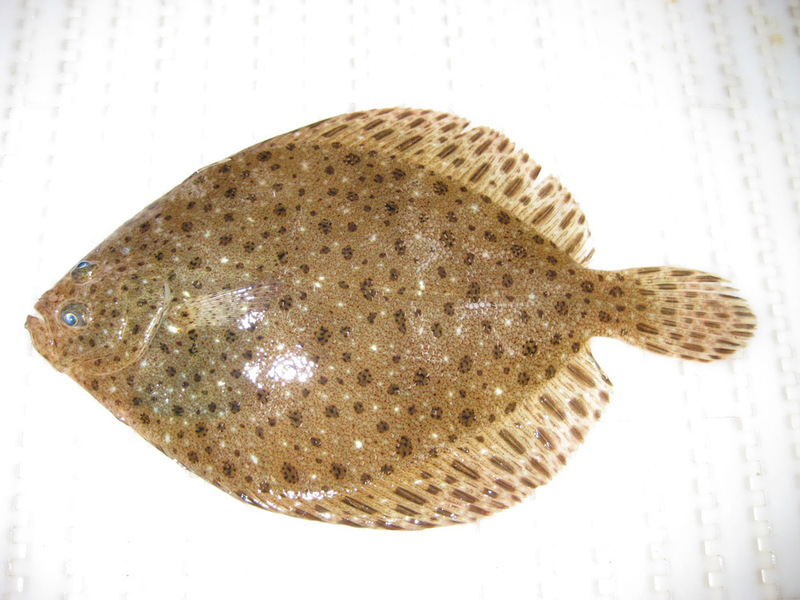 Young windowpane flounder settle in shallow water inshore and tend to move into deeper offshore waters as they grow. Adults may undertake movements along the coast for considerable distances (80 mi, or 129 km, in three months) or even move across open water. Visually oriented, ambush predators that forage on a variety of actively swimming prey, particularly mysids, various fishes, and decapod crustaceans, especially shrimp. They also eat chaetognaths, squids, mollusks, ascidians, polychaetes isopods, amphipods, euphausiids, and salps. 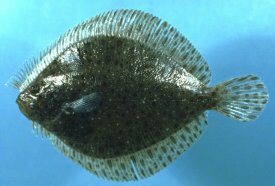 Windowpane flounders, in turn, are eaten by various sharks, skates, stingrays, codfish, cobia, bluefish, and other windowpane flounders. 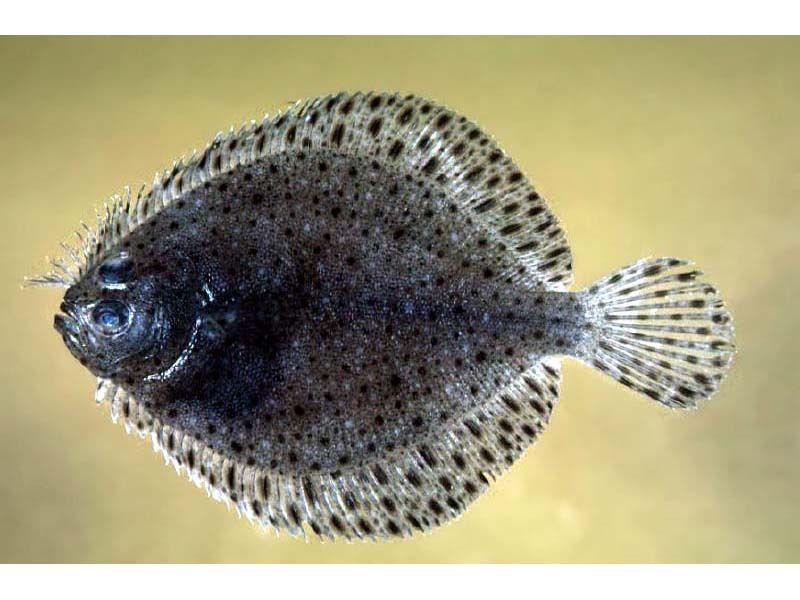 Windowpane flounder of both sexes mature at about the same size, 8.3–8.7 in (21–22 cm) between ages three and four years, with males sometimes maturing at age two. Spawning occurs from February to November, with peak spawning from May through October. There is a strong correlation between water temperatures and spawning. They spawn in the evening or at night on or near the bottom at temperatures from 42.8 to 69.8°F (6–21°C), with optimal spawning temperatures of 60.8–66.2°F (16–19°C) in the Mid-Atlantic Bight and 55.4–60.8°F (13–16°C) on Georges Bank. Eggs are transparent, have an oil globule, and are buoyant. Larvae hatch at 0.07–0.09 in (1.8–2.3 mm), usually at eight days post-spawning in temperatures of 50–55.4°F (10–13°C). Eye migration begins when they reach a length of about 0.26 in (6.5 mm), proceeds very rapidly, and typically is completed by 0.39–0.51 (10–13 mm) total length. Not commercially important and not targeted directly by commercial fisheries. They often are taken as by-catch during trawl fishing.